I have a bone to pick with people who think Takoyaki, or octopus balls, are made out of octopus testicles and brag about eating them as if they were a contestant on The Fear Factor. The octopus ball got the name from its round shape, not from the ingredients. In fact, there’s nothing suspicious inside the Ebelskiver-shaped goodness – just a good old flour, eggs, dashi, chopped scallions, red ginger, and yes, octopus pieces. So, please don’t pretend that you triumphed on The Fear Factor, Man vs. Wild, or any other TV shows that make you eat some weird bizarre sh#@. 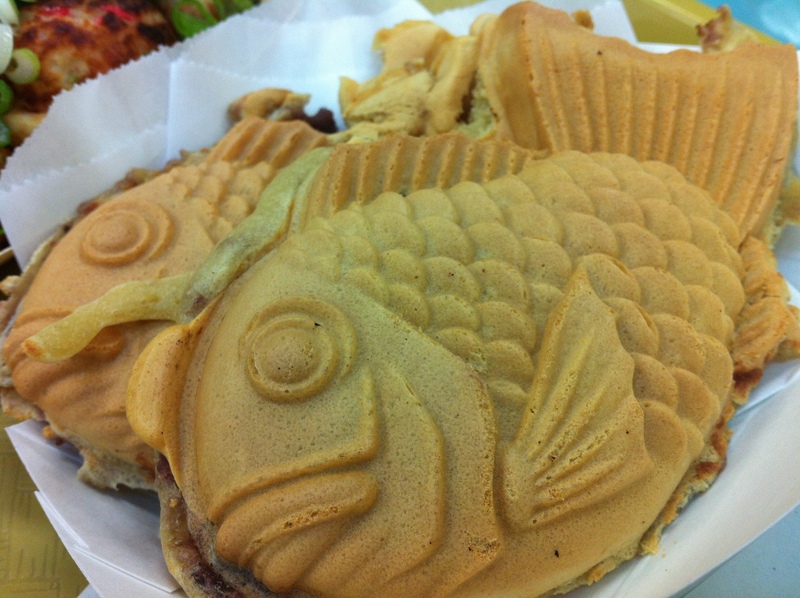 Oh, and Taiyaki, or baked sea bream, is not a fish dish either. It’s a red bean dessert baked in the shape of a fish. 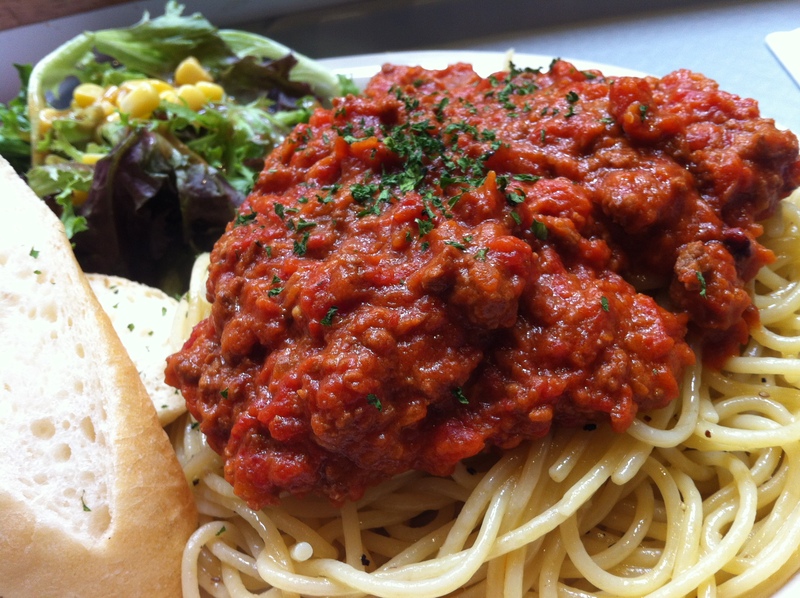 These delicious dishes are from a little shop inside Torrance Mistuwa Marketplace food court. Sorry, I forgot the name of the place. Kevin and I went to Torrance to check out Mitsuwa’s Hokkaido Fair last weekend! We actually decided to skip the limited edition miso ramen from Ezofukuro, and went straight to Santouka. We’ve been disappointed with the over-hyped special ramen from the previous food fairs (it’s such hit and miss), so we decided to stick to the guaranteed goodness of Santouka’s tonkotsu ramen. This is my second favorite ramen shop in Los Angeles, after Daikokuya, and we didn’t have to get in a long line! Kevin ordered the combination, with ramen and pork chashu bowl. It was so delicious! We were already full by the time we finished the ramen and the ice cream, so we took some of the fish cakes home and enjoyed them with the family for dinner. We got some yummy croquettes too! I was born in Tokyo but spent most of my childhood in Fukuoka, before moving to the states in the mid-80s. My old neighborhood where I spent the first seven years of my life in Japan is also the birthplace of Hakata-style tonkotsu ramen, a Japanese noodle bowl in a milky broth made out of cooking pork bones for days. That may be the reason why I love this type of ramen over any other kind, even the more popular shoyu (soy sauce) version. Although I don’t remember eating much ramen growing up, it’s embedded in my DNA to love tonkotsu. It takes me back to childhood. On a random note, my mother loves ramen but can’t stand the tonkotsu broth even though she had lived in Fukuoka for many years. Back when my father was courting my mother, he took her to this ramen shop in Hakata known to serve the best tonkotsu ramen in the area to impress her. The chef prided himself in the soup so much that he told my mother that she could not leave the restaurant without drinking the last drop of the soup. She was already full but had to force herself to eat the entire bowl and got really sick afterward. The experience traumatized her so much that she hasn’t been able to be near tonkotsu since. Poor mom! Now back in the present day, my boyfriend and I found ourselves in Mistuwa market in Costa Mesa last weekend, to check out the Gourmet “Umaimono” Food Fair which featured yummy umaimono (translates to “delicious things”) from Japan, from the northern part of Hokkaido all the way down to Kyushu in the south, including tonkotsu ramen from a highly acclaimed ramen shop, Hakata Ippudo (now also in New York). We tried the ramen, and unlike my mother with her delicate stomach, I slurped down to the last drop of the broth with no problem! The ramen was good, and I particularly enjoyed the combination of oily, rich broth with grated garlic, shredded meat (in addition to a piece of very generously cut chashu pork) and beni-shoga (red ginger), but the dish didn’t blow my mind like I was hoping it would. I think I’d much rather prefer a bowl from Daikokuya or Santouka … they were 10 time better. Takoya Kukuru‘s Takoyaki, a savory Japanese version of a Danish doughnut Aebleskiver, was, however, amazing! The literal translation of this dish to English is “Octopus Balls” because each “ball” that’s made out of vegetable and batter has a piece of octopus in the center, but some people think it’s a dish with octopus you-know-what and run the other way. Please rest assure that there are no Rocky Mountain Oyster things happening in takoyaki and you can enjoy this famous Japanese fair / carnival food in peace. Each takoyaki ball was very soft and creamy and the sweet sauce, mayonnaise, and a sprinkle of aonori took this snack to another level. As much as I love food, I am not usually the one to drive hours and hours for it (I may wait in a long line because I’m a culinary ambulance chaser but driving is a different story altogether). My boyfriend, however, is, so I was not surprised when he asked me to go to Hokkaido with him for a bowl of ramen. Thank goodness Hokkaido came to Torrance this weekend, instead of us having to fly over to the northernmost island of Japan. My boyfriend could have been happy with the bowl of ramen, but my day was not going to be complete until I explored all the other delicious offerings. Right after lunch, and after grabbing several fish cakes and croquettes from the deli sections to take home for dinner, we walked over to the other side for crepe. The price was pretty steep at $5.00 a pop (for something that takes 25 cents to make) but I was happy with the green tea crepe that had whipped cream (Hokkaido is known for wonderful milk products and although I don’t like whipped cream in general, this one was different in a very luscious way), a good chunk of sweet anko (red bean paste) and a sprinkle of green tea power wrapped in air thin, chewy crepe dough. It was fun watching the crepe maker busy at work! The highlight of the day, for me, was definitely the freshly made Shiro Taiyaki. Regular yaikyaki (translates to “baked bream,” because of the shape) is made out of yellow waffle-like batter but this special, Hokkaido kind was made out of rice flour, which gave it a more sticky and chewy texture, like mochi. For a die-hard mochi and anko lover, this one made my eyes roll backward. To this date, I cannot decipher Jennifer Aniston’s soaring popularity. Is she adorable? Absolutely. Talented? I guess. Fashionable? No doubt. But the most beautiful? And the Hollywood “it” girl? Hmm .. I’m not too sure about that one. For me, Captain Kidd’s Seafood in Redondo Beach is like America’s favorite girl next door. While everyone and their mothers seem be smitten by this cozy, waterfront joint, I’m baffled by it all. The place and the food, I thought, were pretty ordinary — no different from any others alas Gladstones (more casual version, of course). I admit, that the service here is relatively quick, the food is affordable, and you can pretty much find anything that live under water here. 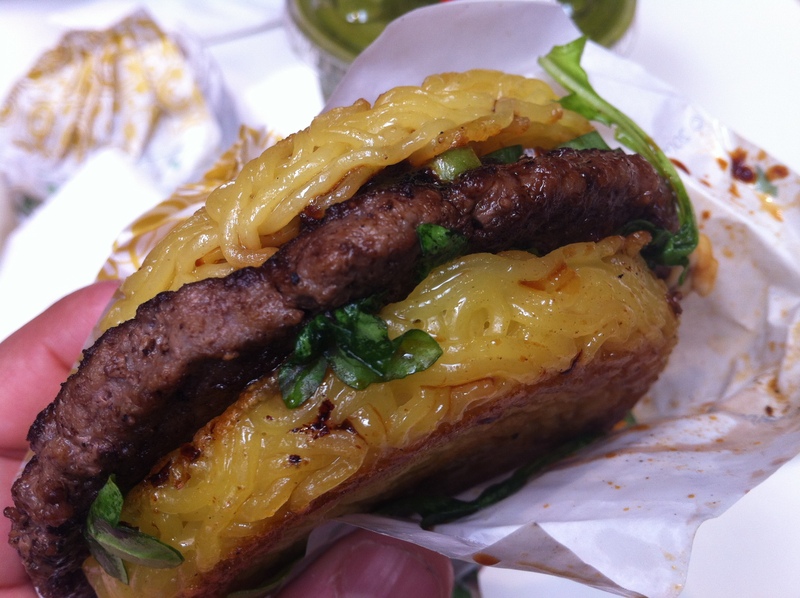 In addition, they’ll cook it to your liking whether you prefer fried, sautéed, grilled or broiled. But I certainly could not figure out what the hype was all about. I ordered the grilled salmon sandwich accompanied by a scoop of cole slaw and hush puppies. You can tell that the fish was fresh and nicely grilled but the slaw was bland and hush puppies … very rubbery. Maybe I didn’t give Captain Kidd’s a fair chance. Because I was there during the Southern California fire, the experience was out-shadowed by the smuggy sky and the fishy air (yikes). Maybe if I return when the sky is clear and the air is fresh, I may have an entirely different experience. And maybe try the crabs that they’re famous for too. But to be frankly honest, I have no desire to even do that. Does this make me a bad person to dis everyone’s best friend like that?